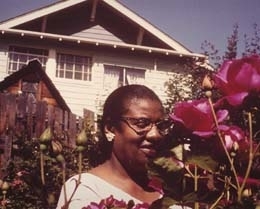 Janie Rogella Washington was the wife of James W. Washington, Jr. (1911-2000), an internationally known Northwest artist. A Seattle nurse, she shared and inspired the spirituality that shaped his art. One of 12 children, Janie Rogella Miller was born near Henderson, Texas to Freeman Miller and Daisy Cameron Miller and educated in the state’s segregated schools, graduating from Emmett Scott High School in Tyler, Texas in 1926. She studied nursing for several years at Butler College in that city and then in 1943, after a move to Little Rock, Arkansas, she met and married James W. Washington, Jr., a civilian electrician with the Navy. The Washingtons moved to Bremerton, Washington where they found employment during World War II in the Naval Shipyard. In 1945, they moved to Seattle; he worked as a shoe repairer at Fort Lawton while she worked at Rhodes Department Store. They bought a craftsman bungalow in the Central Area of Seattle which was their home for the rest of their lives. The basement studio of the home was for 20 years the place where James Washington created most of his major art work. During those years Janie Washington was the sole financial support of the family. In 1992 the City of Seattle designated the home a historic landmark. Janie Washington was employed in the U.S. Public Health Hospital in Seattle as a hospital attendant on a 60-bed ward. She also performed clerical and receptionist duties for the ward nursing-service staff. After taking classes at Seattle Central Community College she was promoted to nursing assistant to give nursing care and nursing services to patients and assist in treatment and diagnostic procedures as directed by a professional nurse. After more than 30 years of service she retired as a practical nurse. Washington was a devout Christian who worshiped at Seattle’s Mount Zion Baptist Church, not far from the Washington home. She served in a number of capacities, most notably as Superintendent of the Church’s Kindergarten and Pre-School. She was also a member of the Eastern Star, a group of wives of Masons and was the longtime treasurer of Jephthah Chapter Number 8. In 1997, James and Janie Washington, and a number of prominent citizens in Seattle, formed the Dr. James W. Washington and Janie Rogella Washington Foundation dedicated to preserving the artist’s artistic and personal legacy. Washington State Supreme Court Justice Charles Z. Smith served as the first president of the board. Three years later on September 9, 2000, Janie Rogella Washington died of Alzheimer’s disease, three months after the death of her husband. HistoryLink.org Online Encyclopedia of Washington State History, “Janie Rogella Washington (1908-2000),” by Mary T. Henry, http://www.historylink.org.